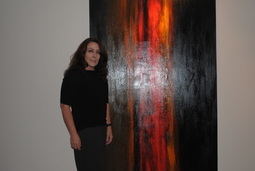 Audrey O'Hearn is an abstract artist whose paintings are typically inspired by her experiences and the impact of world events and issues; her feelings and emotions are captured through her choice of medium, colours, shapes and textures, each part connecting to a common story or message. Audrey is particularly interested on the impact of human action/inaction on the environment. Her art has always been bold and intense but in recent years, the addition of vibrant colour has further expanded her style and portfolio.